ICE Yorkshire and Humber works with local schools across the region to help promote STEM (science, technology, engineering and maths) subjects and encourage pupils to consider a career in civil engineering. Find our more about some of the activities we've carried out in the region. If you've got any questions, or are interested in running an event then please contact us. Yorkshire and Humber's 'Ambassadors' took part in Otley Science Fair in Otley, West Yorkshire, to get members of the public involved in civil engineering-themed activities. The event encouraged visitors of all ages to find out more about science and engineering by taking part in a range of interactive activities. Ambassadors challenged people to build a bridge using only rolled up paper, nuts and bolts. The truss bridges (bridges formed by triangular units) were tested to show the forces acting through the paper, and the importance of quality control in construction. They were then compared with bridges in the real world. 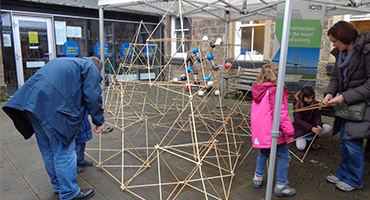 Visitors were also challenged to build part of the team's giant tetrahedron. The Bailey Bridge is in its own self-contained trailer, with solid roof, and can be towed with a standard tow bar. Henry Boot Construction Ltd are the current logistics partner and in the past year have been to nine events and engaged with over 242 students using the Bailey Bridge. We are looking for our next logistics partner for the Bailey Bridge to begin in April 2018. For more information please read the Bailey Bridge Logistics Partner booklet. For further information please see our What is Civil Engineering section. The Huddersfield narrow canal links the Huddersfield Brad canal with the Ashton canal at Portland Basin in Stalybridge, Greater Manchester. The structure follows the valleys of the rivers Colne and Tame. The 32km canal is the highest in the UK – 197m above sea level as it passes through the Standedge tunnel. With 74 locks, 10 reservoirs and 5 aqueducts, it can take boats up to 21.3m long and 2.1m wide. The structure has a summit pound 6.4km long. A summit pound is a canal’s highest stretch of water between 2 locks. From its summit, the canal falls 108.2m through 32 locks to the west in the direction of Manchester. It falls 132.9m through 42 locks to the east in the direction of West Yorkshire. The route passes through 2 tunnels — the 200m Scout tunnel and the 5.2km Standedge tunnel between the villages of Diggle and Marsden. The Standedge tunnel is both the longest and highest canal tunnel in Britain. The canal originally had 2 reservoirs – both in the west Yorkshire stretch. March Haigh reservoir holds 323m litres. Slaithwaite reservoir has a capacity of 309m litres. A further 8 reservoirs were built in later years, adding 911m litres to the scheme’s overall capacity. The structure was built to carry cargo between the growing industrial centres of Huddersfield and Manchester. It closed in 1944 after operating for 133 years. It reopened in 2001 for leisure boats. It’s one of the projects celebrated civil engineer Thomas Telford was involved with. York railway station was the largest in the world when it opened in 1877. Built by the North Eastern Railway, the structure included 13 platforms, a train shed, station buildings and a hotel. The track layout of the new station allowed trains to pass directly through York for the first time. The previous building, now known as York old railway station, was designed as a terminus – trains for London had to reverse out of the station to continue their journey. York station was designed by Thomas Elliot Harrison, a former president of ICE. Two additional platforms were added in 1909. Other later works included repairs after extensive bombing in World War 2 and changes to track layout in 1988 as part of preparations for electrification of the line. York remains a key junction today. It's approximately halfway between London and Edinburgh. The station is about 5 miles north of routes connecting Scotland to the Midlands and southern England. York station became a Grade 2 listed building in 1968. To help promote civil engineering achievements close to you and across the UK, we're running a campaign called This is Civil Engineering. We're highlighting projects across Yorkshire and Humber that are helping to improve lives and improve our environment.